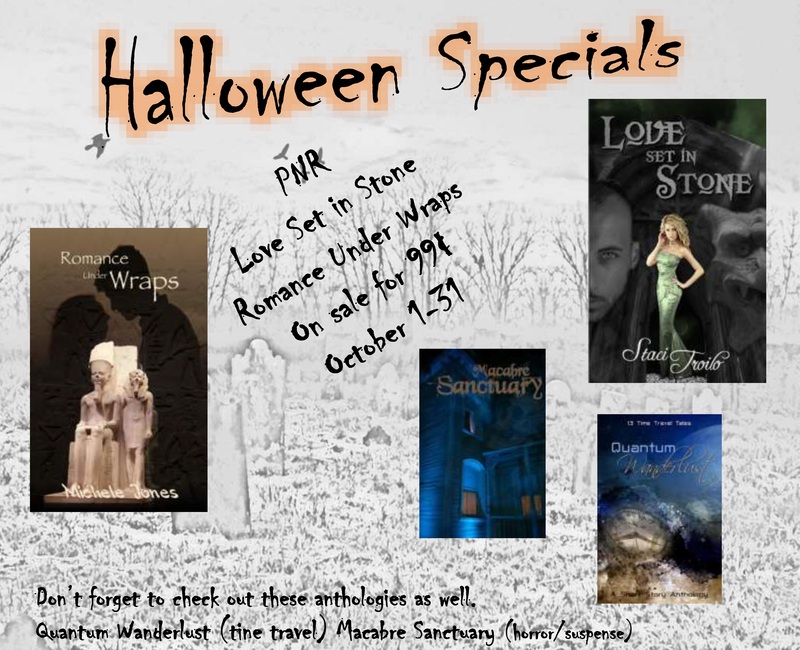 Love Set in Stone and Romance Under Wraps are only 99¢ for the month of October. 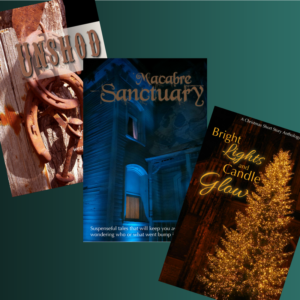 If you want suspense, thrillers, and sci-fi, you can download Macabre Sanctuary and Quantum Wanderlust, free. Simply select and download. Pour yourself a glass or mug of your favorite beverage and start reading. Perched above Pittsburgh, a gargoyle spends centuries as a protector of humanity while he waits for the one who will break his curse and free him from his stone prison. When he finally finds her, her life is in jeopardy, and he realizes he may face eternal damnation to save her life. The Carnegie Museum of Natural History gets an Egyptian installation, and it seems to come with the ubiquitous mummy’s curse. Death and destruction abound. But the real curse is on the mummy’s advisor—he must teach the mummy how to pass forty-three judgments or find the reincarnated queen and win her love—or they are doomed to continue reawakening every century to try all over again. If you peruse the AIW Press website, you’ll see we’ve published a few anthologies, and we currently have another one in the works. If you’re a novelist, you might wonder why you would ever consider writing a short story for inclusion in such a compilation. After all, it takes writing time away from your ongoing novel projects. Don’t let that discourage you. There are five advantages to participating in an anthology. (1) Writing short works helps you hone your writing skills. When you participate in anthologies, you will most likely have to adhere to a set word count, one that is substantially smaller than that of the novels you’re used to writing. While this virtually eliminates the possibility of introducing secondary characters and developing subplots, it does teach economy of phrase. When every word counts, writers tighten their prose. They eliminate filler words, passive voice, weak writing, or tangential thoughts—pretty much anything that requires extra words. No um’s or uh’s or well’s. No “was walking” when “walked” suffices. No “walked slowly” when “strolled” captures the mood better. No drifting into a daydream that doesn’t advance the plot. These things slip in when we write novels, but they don’t really belong there, either. And just think how strong your novels will be when you develop these stylistic choices and apply them to your longer works. (2) Publishing with other authors helps you reach a larger audience. When you only write novels, you deprive yourself of the opportunity to work with other authors and have introductions to their fans. Yes, you could participate in novel boxed sets (something I also advocate), but novels are much longer, and if your novel is placed in the back of the set, readers may never get around to reading it. If you write a short story for an anthology, though, the chance of readers reading through the very last contribution is much higher. Also, in addition to the readers who chose the anthology because of the subject matter, there will be people who read the anthology specifically because they are fans of one of the contributors. This affords you the chance to reach a dedicated fan base of not just one, but several of your peers—an opportunity you otherwise wouldn’t have. (3) The contacts you make can lead to a larger marketing pool, both now and in the future. But there’s a future benefit, too. You will get to know the anthology authors and their work. When you have something else to market—for example, a new novella or novel—you can call upon these contacts and request help getting the word out. Perhaps they’ll review an ARC or offer you guest posts on their blogs. And what author can’t benefit from more exposure? (4) The short story can be used to introduce one of your longer works. Regardless of the theme of the anthology, you can write a companion piece to an existing novel or series. This can be an excellent marketing tool. For example, say you have a paranormal romance series you’d like to promote, and you have an opportunity to contribute to a horror anthology. You could tailor your horror story so that it’s a prequel or sequel to the first book in your paranormal romance series. You might even choose to weave in a little romance so readers have a better understanding of what to expect in the series. As long as the story meets the requirements for the anthology, you’ll have a great introduction to your longer work placed in front of an already interested audience. (5) The short story format allows you the opportunity to explore different genres without committing time to compose a longer work. This is kind of opposite to number four. Instead of expanding your series offering, you might take the opportunity to try something completely different from what you normally write. For example, a regency romance writer might choose to craft a futuristic sci-fi story. What do you gain from such a departure? Well, not only do you get to flex your creative muscles, the departure might actually recharge your batteries and give you a fresh perspective on the novel you’re working on. Furthermore, you may just find another genre that you enjoy writing in and a new fan base should you decide to become a multi-genre author. These are just five of the benefits to writing short stories for anthologies. Can you think of others? Have you contributed to an anthology before? Why not share your experience with us? Leave a comment below. Do you need help putting the finishing touches on your masterpiece? Are you stuck on a chapter and need some advice? All authors need a second set of eyes on their work. Someone that will give honest feedback and check for errors. If they ask for your help, they trust you and value your opinion. They are depending on your skills to make their story better. Below are the top ten tips to providing a helpful critique. Remember, if this isn’t your favorite type of story, let the author know. However, don’t be afraid to critique something if you’re not familiar with the genre. While reading, consider the target audience before making suggestions. An honest evaluation is critical for any author. 1. Begin by reading the piece. Don’t make any corrections or judgments until you have read the complete work. This will give you a feel of the story and tone the author is using. 2. Write down your thoughts as a reader. After you have finished the initial reading let the author know what you thought about his work. Tell her what worked for you and what you believe needs changing. 3. Suggest feedback on what could be changed including grammar and spelling. 4. Give praise if you liked something but never criticize the author personally. This is important for the author. If something made you smile, touched you in any way, or made you hate the villain, let the author know. This feedback will help the author make corrections to that work as well as in composing future writings. If you didn’t like something, don’t attack the author directly. Suggest an alternative. Let the author know that passage didn’t work and why, and then suggest an alternative. 5. Does the opening draw you in? Most readers judge a book in the opening few pages. If the opening doesn’t grab you, most likely it won’t grab the reader. Let the author know why you didn’t like it. Give her a suggestion to make it better. 6. Does the story flow logically? Tell the author if there are holes in the plot. For example; if you are in a hospital and want information on a non-relative patient, you wouldn’t be able to go ask the doctor or see the information regarding that patient in the computer. Also, you cannot know something just because you need it to advance the plot. The story needs to get there logically. 7. Is the setting detailed enough to ground the reader? Give the reader subtle clues as to where you are. You can use nurses, doctors, and the operating room to set the scene in the hospital without saying you are in a hospital. 8. Are the characters well rounded or one note? Give the reader information about the characters in casual conversation or in small amounts in narration. The reader doesn’t want to read an entire chapter describing what a character looks like and does for a living. And remember—even villains have some redeemable quality, so factor that into your descriptions. 9. Does the author switch point of view? Did the author stray from the current character point of view to another point of view? Does she head hop? If you are telling a story from the man’s point of view, you cannot have a paragraph from the woman’s point of view. Max spied the redhead sitting alone at the bar. She was tiny, had red hair, and a beautiful smile. Max hoped she would notice him. At first, Fiona just played with her drink, stirring it with the tiny straw. Finally, she looked up and locked eyes with Max. Her heart pounded with excitement. In this example, the POV character is Max. That means the second paragraph is out of POV (or there was head-hopping) because it’s not from Max’s perspective, but rather is from Fiona’s. This is distracting to readers and should be avoided. For example; he was angry. John stomped across the room, tackled Ralph , and pinned him to the ground. While down, he repeatedly punched him, beating him until his face was unrecognizable. The critique process is vital to producing a well-crafted novel. But remember, critiques are only suggestions by your critique partners and you don’t need to follow every suggestion. So find someone you trust and start a working critique relationship. There you have it. The top ten tips to becoming a good critique partner. Do you have any other tips to add? Let’s talk about it. Actually, yes, it is our first rodeo. Well, it’s our first western, anyway. We marketed this with the tagline: Not Your Granddaddy’s Westerns. Why? Because, well, for starters, there are no rodeos in this anthology. (Well, there is a small rodeo scene in one of the stories, but it’s not your average cowboy tale.) Not many of the stories fit into the “Old West” fiction trope. When you think of westerns, you probably think of John Wayne and Clint Eastwood. Tumbleweeds and prairies. Old saloons and brothels. Six-shooters and dynamite. White-hat sheriffs and black-hat outlaws. That’s the old west. And that’s fine. It’s a tried and true genre; one enjoyed by multiple generations. The official definition of a “western” though is a story that takes place west of the Mississippi River. And that leaves a lot up to interpretation. 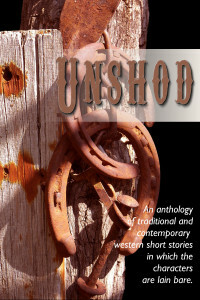 In Unshod, we accepted a wide range of stories—modern and historical, romance and action, realistic and supernatural. We accepted them because they embraced the definition of “western” in the broadest sense of the term, while allowing authors the freedom to explore many facets of the genre and readers to immerse themselves in various types of stories. Traditionalists might be scandalized by the thought of a modern western or a supernatural love story, but many readers loved the contemporary twist this anthology offers. 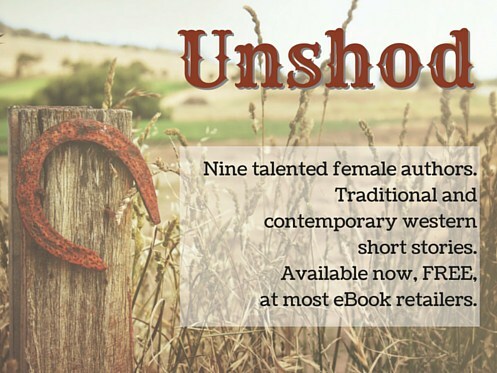 As warmer weather rolls around and rodeos ride into towns across the country, we invite you to check out Unshod. They’re not your granddaddy’s westerns, but they’re darn good.